I turned on the television this morning expecting to tune into to a classic old Louisiana cooking show. Instead, I was treated to a woman making peanut butter chocolate mousse with tofu. To get the horror out of my brain, I decided to use my new hazelnut flour and make cookies. Thumbprint cookies usually have jam – and you could still use some here. I think strawberry or blackberry would go really well. However, I’m not about to turn down an opportunity to use chocolate. I had planned to use Nutella but I was out so I sort of made my own spread with bittersweet chocolate and cookie butter. The final result was nutty and chocolately and definitely what the doctor ordered to clear my thoughts of tofu surprise. Preheat oven to 350°. Separate eggs, reserving the whites. In a large bowl, mix butter and sugar until combined. Stir in egg yolks. Add hazelnut flour, cinnamon, vanilla and salt and stir to combine. Scoop tablespoons of dough. Roll the dough into balls and brush the balls with the eggs whites. Place about two inches apart onto baking sheets. Make indentations in the center of each ball with a small measuring spoon. Cook for ten minutes. Melt the bittersweet chocolate and cookie butter together. After 10 minutes of baking the cookies, add a ½ teaspoon of the chocolate mixture to each indentation. You may need to remake the divots first. If you’d rather do fruity thumbprints, slightly warm 1/4 cup of your preferred jam in the microwave, just enough to loosen it up a little. As above, after ten minutes of baking the cookies, spoon jam into indentions. Bake until cookies are set and golden around the edges, an additional 5 to 8 minutes more, rotating sheets when putting them back in the oven. Let cool on baking sheets on a wire rack for 5 minutes then transfer cookies to the rack to cool completely. Oh, and these are gluten free, too! The board I serve on is having a Strategic Planning session on Saturday and I decided to make brownies for that mid-afternoon pick me up we will desperately need to keep us going to the end. As I know of at least one person on my board who is gluten intolerant, I am making two pans of brownies. The first one is a one-bowl recipe that I found years ago. It is rich and chocolatey with chocolate in the batter and chips in the pan. It is my go-to brownie recipe. The other is an adaption of a recipe I found on Bon Appetit. This one is quite chocolate, too, and I put whole pecans on top to help folks tell the difference. With luck, these will both satisfy and keep engage everyone who snacks on them! Preheat oven to 350 degrees F. Butter a 13 x 9-inch baking pan. Melt 1 cup morsels and butter in large, heavy-duty saucepan over low heat; stir until smooth. Remove from heat. Stir in eggs. Stir in flour, sugar, vanilla extract, salt and baking soda. Stir in remaining morsels and nuts. Spread into prepared baking pan. Bake for 20-22 minutes or until wooden pick inserted in center comes out slightly sticky. Cool completely in pan before cutting into squares. Preheat oven to 350° F. Butter a 13×9″ baking pan. Melt 1 1/2 cup chocolate with butter in a a double boiler, stirring, until butter and chocolate are entirely melted and mixture is smooth. Let cool slightly. Whisk flour, baking powder and salt in a small bowl. Using an electric mixer on medium-high speed, beat eggs, sugar, and vanilla in a large bowl until mixture is pale and thick, about 5 minutes. Reduce speed to low and add dry ingredients, mixing just to combine. Mix in chocolate mixture. 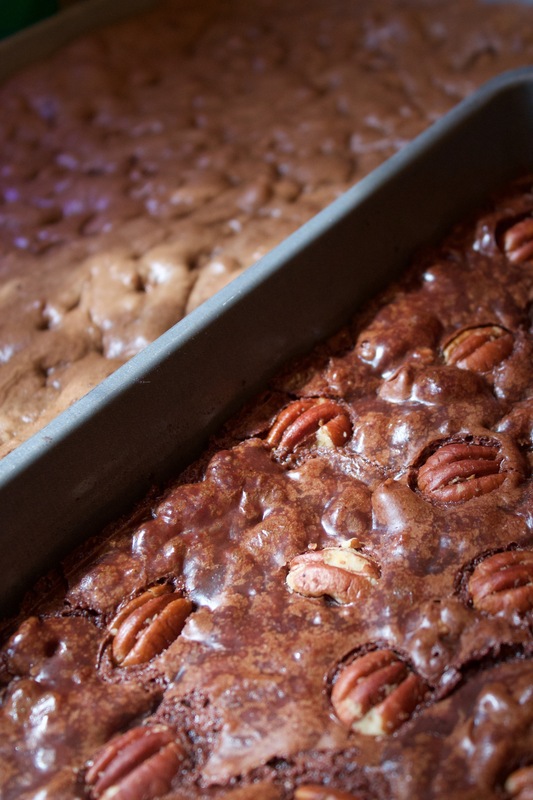 Fold in remaining chocolate and two-thirds of pecans. 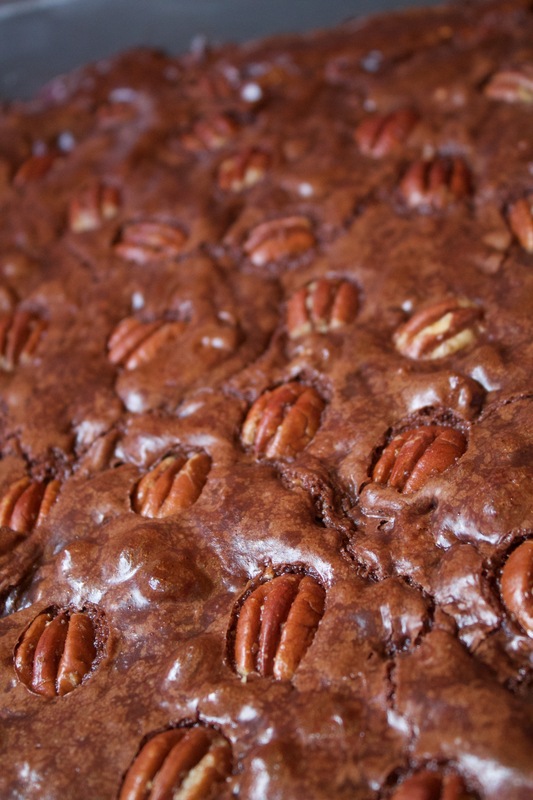 Scrape batter into prepared baking pan and sprinkle with remaining pecans. 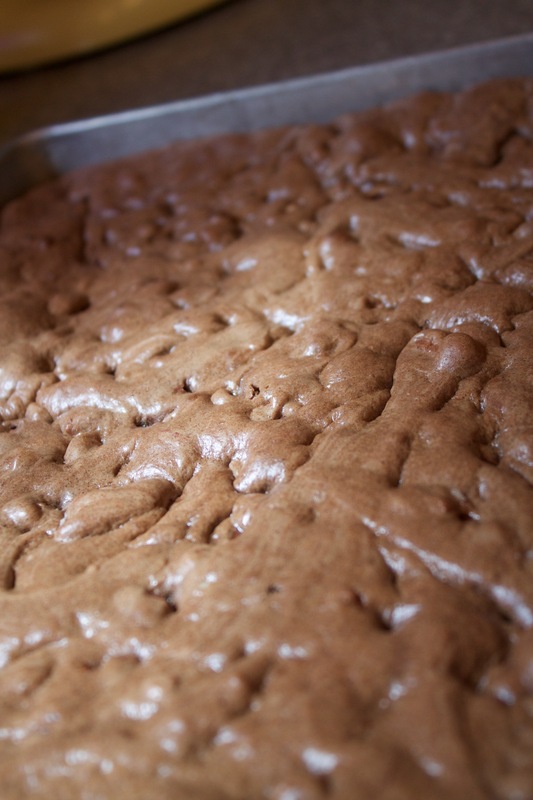 Bake brownie until puffed and top is cracked and looks dry and shiny, 30–35 minutes. Let cool completely before cutting into 2″ squares.